Southern San Andreas Super Autos has four additional vehicles to add to your GTA Online garage this week. Plus, those who get involved in Business Battles this week will earn double rewards. GTA Online players who stop in at Southern San Andreas Super Autos will find the inventory has expanded by four. Head on over to the dealerships and grab your very own Benefactor Serrano, Karin BeeJay XL, Fathom FQ 2, Emperor Habanero, or all four. Arena-based Trading Places (Remix) continues to pay out double rewards this week in RP and GTA$ until September 17. Nightclub owners also see a 2X Popularity Boost for completing Nightclub Management Missions, and arms dealers will gain a 25% Speed Boost on Gunrunning Research & Manufacturing. Those who log in to GTA Online any time through September 17 will unlock the Gefängnis T-Shirt to complete their nightclub duds collection. Plus, logging in will also unlock the Sessanta Nove Multi-Color Livery for the Mammoth Avenger. 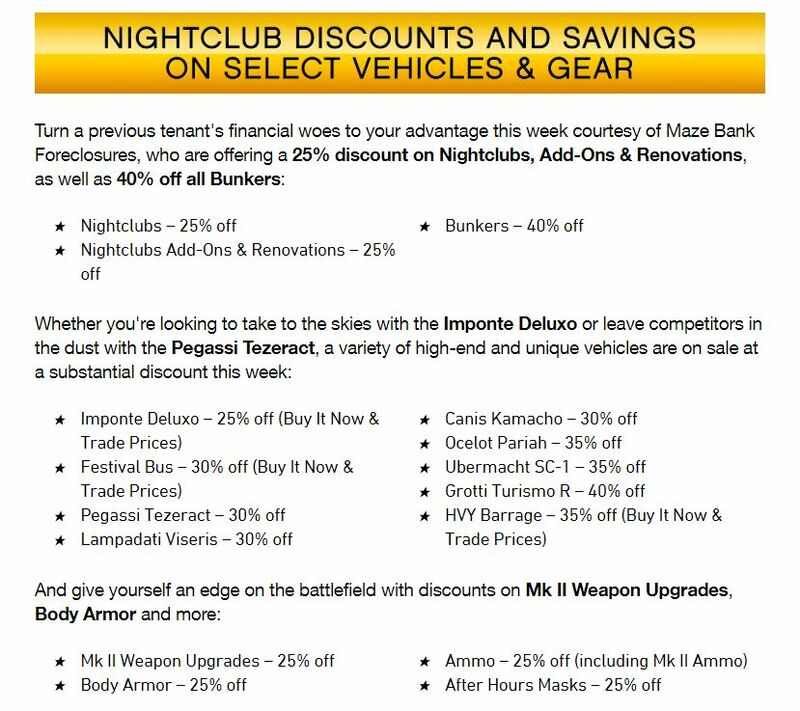 Finally, Maze Bank Foreclosures are offering a 25% discount on Nightclubs, Add-Ons & Renovations, and 40% off all Bunkers. There are deals on vehicles, upgrades, and body armor this week as well. All discounts are posted below.